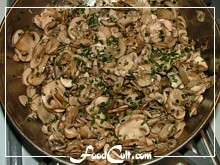 Slice mushrooms to about 1/16" to 1/8" (about 2 mm) thick. With barely enough butter to coat the pan, put all the sliced mushrooms into the pan on medium-low heat. Stir the mix regularly so it cooks evenly without burning. Once the liquid from the mushroom is gone (when the mushroom is almost cooked) drizzle about 1 tablespoon of maple syrup over the mixture. Stir well and taste. Add maple syrup in small amounts until you can just barely taste its sweetness. 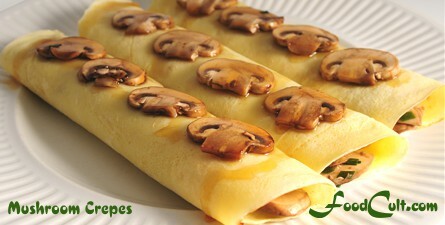 The topping for these crepes was prepared by carefully slicing uniform pieces of mushroom. These slices were fried in a little of the mushroom-maple syrup liquid left over from the bottom of the pan after the fillling mixture was removed from the pan. They were turned only once - frying until the liquid was gone. They were then laid out on top of the crepes and drizzled with maple syrup. We like, essentially, two varieties for this recipe - that would be either the white button mushroom or the cremini (sometimes known as coffee mushrooms). In fact, the white button mushroom is, in our home, prefered for this recipe - the cremini (an under-matured portabello) is, for our tastes, just a little to flavourful for this recipe. We rather depend on the gentle mushroom taste - sweetened lightly by maple syrup. While there are a range of commercially available mushrooms one may try - from enoki to oyster and shitake, we still prefer the taste and texture, for this recipe, of the common, white, button mushroom. What ever you choose, this crepe is a healthy, delicious, dinner crepe (of course, it can't hurt as a snack or dessert either - after all - it's a crepe)!